When Michel Mayor and Didier Queloz discovered the first exoplanet orbiting a normal star twenty years ago, they started a revolution in astronomy: An ancient human dream became research reality. «There is an infinite number of worlds, some like and some unlike our own.» With this quote by the Greek philosopher Epicurus, the Genevan astronomer Michel Mayor began his lecture at the University of Bern on the occasion of two anniversaries: Twenty years ago Michel Mayor found together with his PhD student Didier Queloz 51 Peg b, the first exoplanet that orbits a star like our Sun, whereas 200 years ago Geneva joined the Swiss Confederation as the 22nd canton – a reason to reinforce the connection between Geneva and the Swiss capital Bern. Epicurus’ quote is 2300 years old – and very timely. Since 1995 almost 2000 exoplanets have been detected. «Their diversity is huge», said Michel Mayor. The newly discovered objects and planetary systems are by no means just copies of our own solar system. «The image is much more complicated.» Besides hot gaseous giants orbiting their parent star incredibly fast, there are also exoplanets with very eccentric orbits. «Nothing similar exists in our solar system,» said the expert. With the HARPS spectrograph mounted on a telescope in Chile, developed and built in a collaboration of Geneva, Bern, and two other institutions, astronomers detected amongst many other objects a compact system with seven planets. 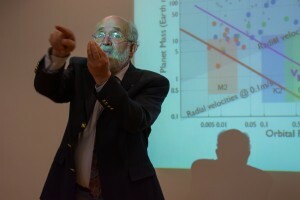 «The discovery of exoplanets started a revolution in astronomy,» said Willy Benz, director of the NCCR PlanetS and the Physics Institute of the University of Bern. The new findings significantly contribute to the motivation to build even bigger telescopes as it is planned in the next years. Already now the HARPS spectrograph can measure the velocity of a star with an amazing precision of 0.3 metres per second. «This is the velocity of a pedestrian that even doesn’t walk fast,» explained Michel Mayor. For studying twins of Earth in a region where life could exist astronomers are eagerly waiting for new instruments like the spectrograph ESPRESSO that will be installed at the Very Large Telescope (VLT). Although the astronomers are convinced that an enormous number of Earth-like planets are orbiting their stars in the so called habitable zone, where water is can exist in fluid phase, there remains one big open question: Is life a cosmic imperative? Is it inevitably born if the conditions are favourable? Asked as a scientist Michel Mayor answered: «I don’t know.» But personally he wouldn’t have any problem to be a product of the evolution of the universe, he added. 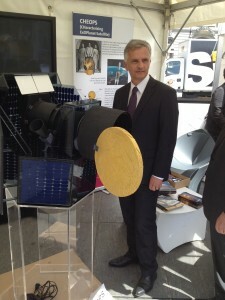 Before Michel Mayor’s lecture, the public had the opportunity to visit a temporary exhibition in front of the Federal Palace in Bern organized by the canton of Geneva and presenting the NCCR PlanetS. «People were asking many different questions about planets and the universe,» said Christoph Mordasini, Professor at the University of Bern and member of PlanetS who was in charge of presenting the display together with a colleague from Geneva. 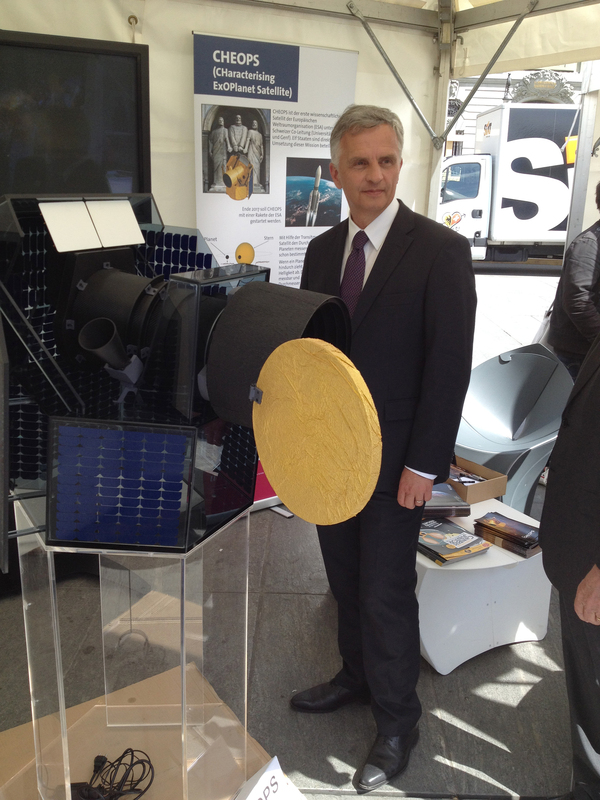 «It was fun to explain what we are doing.» Among the guests who had a close look at the model of the Swiss space telescope CHEOPS was Didier Burkhalter, member of the Swiss Federal Council.